Happy New Year from Advice Interactive Group! While the New Year always brings with it a time to consider bettering ourselves physically, mentally, and morally, it’s also a time to look forward to the next year of your business. And if you’re a marketing professional, this means figuring out your plan of attack. Social media sites have become the dominant factor in online web presence. The Skinny Social reported in September 2012 that 91% of online adults use social media on a regular basis. This probably means that social media marketing makes up at least a portion of your marketing efforts. So while you’re trying to decide which of your resolutions you’ll really stick with this year, remember that this time of year is also for strategizing. That being said, it’s time to decide your social media resolutions for the new year! Below are some social media strategies you may want to consider going forward into 2013. I have a smartphone. You have a smartphone. We all have smartphones. And what do we do with our smartphones? Besides obsessing over virtual farms, smashing thieving pigs, and running through crazy Mayan-esque mazes, we surf with them. Our phones (and tablets and e-readers) connect us to the world around us, allowing us to instantaneously retrieve information. 02 released a study last fall that looked directly at smartphone usage. According to its findings, smartphone users spend approximately 25 minutes each day surfing the Internet—that’s almost 3 hours a week! Additionally, 18 minutes every day—approximately 2 hours each week—are spent on social media apps. So what does this mean for marketers? Simple: get with the program. Mobile is the new black, and more and more users are searching via their phones. In fact, the O2 study found that over a quarter of participants (28%) prefered using their smartphone over a laptop. It’s time to make your site mobile-friendly. I can’t tell you how many times I’ve personally tried to search for something on my phone, just to find that the site took forever to load and the text was so tiny I had to continue enlarging and scrolling to find what I needed. I’m sure you’ve been through something similar. In fact, Search Engine Watch reported in September that 72% of consumers are more willing to revisit mobile-friendly websites. 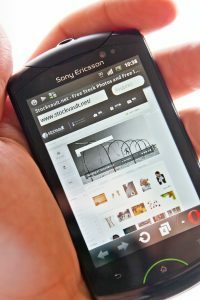 Smartphone users who visited sites that weren’t mobile friendly were more likely to leave and look for what they needed elsewhere—a.k.a., at a competitor’s website. So, ask yourself this: Can your business really afford NOT to go mobile-friendly in 2013? Ads have never been more prevalent in social media than at the end of 2012. The (in)famous Facebook update that made paid advertising shares rank above organic shares has changed the way that social media marketers think about social sharing on Facebook. No longer can you simply post a link and let it go—it simply won’t be as visible as it used to be. Instead, it’s time to devote part of your budget to social media advertising. Facebook and Twitter may not sound like important marketing platforms, but they really are. According to Hubspot’s “The 2012 State of Inbound Marketing,” 77% of polled B2C companies were able to gain a customer through their Facebook engagement. For B2B companies, LinkedIn proved to be the most effective platform, with 65% of respondents claiming they were able to gain a customer from engagement there. That’s all well and good, but how do they do it? A DOMO infographic published this summer notes that nearly 700,000 pieces of content are shared on Facebook EVERY MINUTE. On Twitter, users send over 100,000 Tweets. And Google processes over 2 million search queries. EVERY. SINGLE. MINUTE. Promoted Tweets allow your content to be “pinned” to the top of your Twitter profile and a popular Twitter search. Paying for social media advertising (even just a little bit) allows your content and your brand to be pushed out of the noise that is social sharing. More people will see your stuff, meaning more impressions and more chances to gain someone’s interest. Funneled down, this means more customers for you. Look into your options for Twitter’s Promoted Tweets program, or Facebook’s Targeted Advertising. More sales, more money, more happiness, right? This latest feature of the increasingly popular Google social media site was unveiled in early December. Reminiscent of Facebook Groups, these communities bring people together for the sole purpose of connecting and sharing ideas about specific topics. 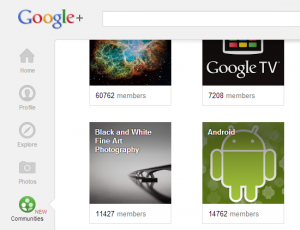 There’s a community for everyone—from Doctor Who (of which I am a proud member) to social media marketing to “Cats of Google+” (whatever that is). But this also means there’s a place for you and your business. It’s time to plug yourself and your business into online networking communities. Join some groups, share your ideas, get your name and your brand out there. I have a strong feeling that these communities will prove incredibly useful as they grow and develop. Last year was incredible for social media marketing, and I’m sure this year will be no different. Keep these social media strategies in mind as you progress, and make sure you’re on the lookout others that will undoubtedly appear as the year moves forward. Wishing you all the best of luck with your marketing strategies this year—make 2013 a great one!